One of the simplest (Chinese style) recipes to cook a pig’s trotter, with simple ingredients i.e. soy sauce, dried mushrooms and some seasoning. 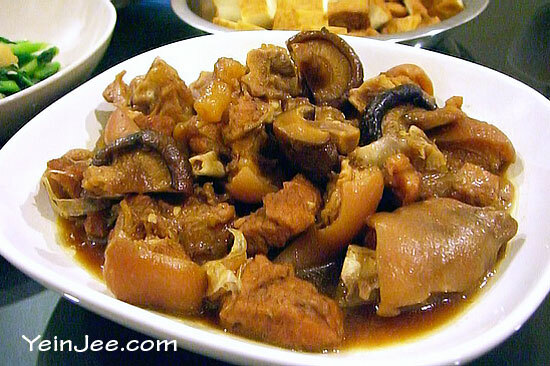 1 pig trotter (chopped), 8-12 dried mushrooms; 1-2 tbsp cooking oil. A: 6-8 cloves of garlic, 1 cinnamon stick (~3-4cm), 1-2 star anise, 2-4 cloves. B: 1 tbsp dark soy sauce, 3-4 tbsp light soy sauce, 1 tsp salt. X cup of water (read below). 1. Blanch the chopped pork trotter – put the trotter in boiling water for 3-4 minutes, then remove it and rinse it with cold water. Blanching helps removing some unwanted substances (clogged blood, tiny bones) and odour from the pork. 2. Heat the wok and cooking oil; put in ingredients A and stir fry for a minute (until the aroma pops up). 3. Put in the trotter after that and stir fry for 2-3 minutes. Then add in 1-2 cups of water and cooked it under maximum heat. Add ingredients B and mix it up. 4. Cover your wok (keep the max heat), and stir the trotter every 2-3 minutes; add 1/2 cup of water if the stock start to thicken. Repeat this for 20 minutes. This step (4) will help reduce the simmering time (5) and to ‘lock’ the flavours. 5. Put the trotter and mushrooms into a pot, add in water just enough to cover the trotter, boil it. Reduce the heat (low) after the water is boiled, simmer it for 40 minutes (add another 60-70 minutes if you skip step 4). Slightly stir the trotter every 10-15 minutes to prevent sticking. Have the butcher to chop the trotter; it’s not easy chopping it yourself. Remember to soak the dried mushrooms in water to soften it before cooking. You can skip step (3) and (4) if you want to. Just dump all ingredients into the pot and simmer it for close to two hours. Cooking time and amount of seasonings are flexible upon your preferences. The above method produced a relative mild taste and just tender meat. Add extra cooking time if you prefer softer meat. Add extra light soy sauce (and salt) if you prefer stronger taste; alternatively you can add another 1-2 tbsp oyster sauce and/or 1/2 tbsp sugar and/or a pinch of white pepper. Do not use a non sticky wok for step (3) and (4)… your wok could easily spoiled because of the sharp bones.